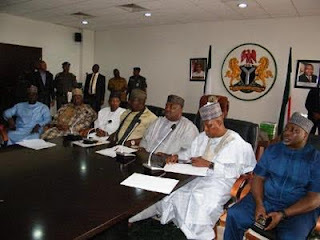 APC Governors and members of the Northern Governors Forum yesterday, paid a condolence visit to Enugu state governor, Ifeanyi Ugwuanyi, following the recent attack by some herdsmen in Nimbo community in the state on April 25th. The governors were led by their chairman, Owelle Rochas Okorocha of Imo State and chairman of Northern Governors’ Forum, Kashim Shettima. Speaking at the meeting, Governor Shettima likened the trauma being faced by Nimbo people and indeed the entire Enugu State to that of victims of Boko Haram insurgency in Borno State. He applauded the people of Enugu State for their peaceful conduct since the attack happened.